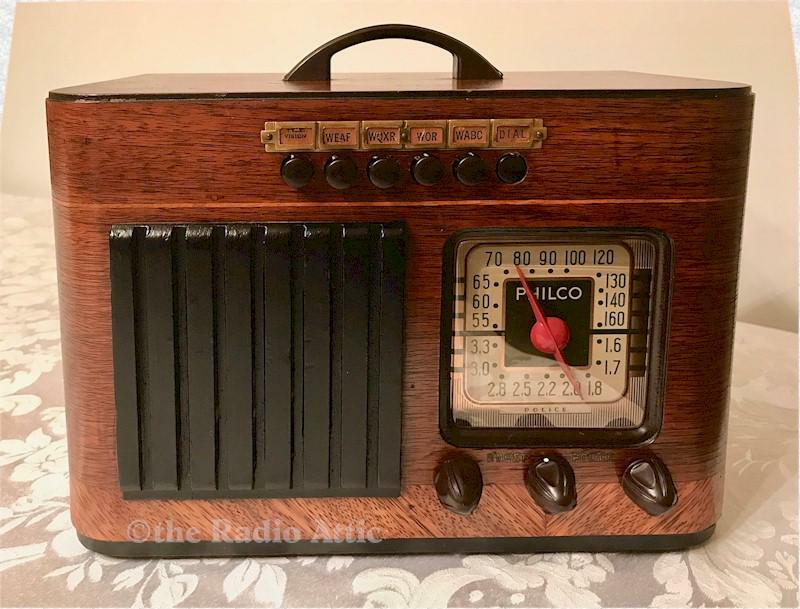 Philco introduced the 40-125 in their fall line-up for 1940 and it was a big hit. This beautiful original finish cabinet (sans the grille, which looks like it was touched up) has very little wear and looks fabulous. Original handle on top, push buttons, nice knobs, and back. The electronics have been completely restored (no shortcut repairs and it is internally fused for your safety), and it plays very nicely on the AM broadcast band with its internal antenna and also has the old "police" shortwave band. I've added an MP3 input for your listening enjoyment should you wish listen to your own supplied music. You�ll really love the style and due to its small size, it will fit just about anywhere. 10-3/4"W x 7-1/2"H x 6-1/4"D.